The dēzl 760LMT is the navigator with a big 7" screen designed specifically to make a trucker's life easier. Not only can it guide you along a route customized for your truck and trailer, it helps ensure you're in the proper lane with Active Lane Guidance. It also helps with IFTA and HOS logging. It also shows you exit services ahead, along with trucking points of interest (POIs). When you trust dēzl 760LMT to create a route for you, you'll know it's a good route for both you and your rig. Track and Report Your Trips The dēzl 760LMT makes logging and retaining trip information easy. You record fuel usage, and the 760LMT automatically records state mileage for IFTA fuel logging. Log your hours of service and driving status, and the 760LMT tracks your hours and automatically warns you of HOS violations. Conveniently export all logs for improved reporting and tracking of each trip. See More With a large 7" high-resolution touchscreen display, dēzl 760LMT allows you to see tons of information in great detail. Clearly follow the highlighted truck-friendly route, view truck warnings, notifications and alerts. And only a dēzl 760LMT includes exclusive Garmin Active Lane Guidance (ALG). ALG shows you constantly updated animation of the preferred lane to be in. It also includes photoReal junction view, which provides photo-realistic views of upcoming junctions to guide you to the right lane at the right time. All of which are especially helpful when navigating complex highway interchanges in unfamiliar metros. 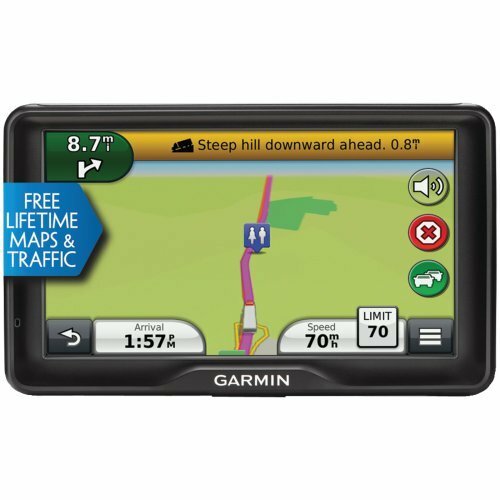 Navigate with Confidence With detailed maps and turn-by-turn directions that speak street names loud and clear through the speaker, dēzl 760LMT provides specialized routing¹ to support truck-related restrictions in both the U.S. and Canada (customizable by height, weight, length, width and hazardous materials). Simply enter dimensions and load restrictions, and dēzl 760LMT guides you according to your requirements on a route that fits your load.